3. How electrons are distributed in atom shells? 4. Mass number, atomic number, and how they are written together with the chemical symbol? 6. What liquids conduct electricity and why? Atom construction, constituents - their properties? The atom nucleus consists of protons and neutrons. Protons are positively charged and neutrons are neutrally charged. The atomic weight is made up of essentially the atomic nucleus. The task of the neutrons is to hold together the protons. If the nucleus would be as big as a “putter and ball” and located in the middle of Ullevi Stadium (Sweden), then the electrons would orbit the stands and would be the size of pinheads. Most of the atom is thus void or vacuum. All elements are presented in the periodic system (table of elements). Behind every element is only one kind of atoms. The vertical columns 1-18 down are called groups. There are 18 groups. All elements in the same group have similar properties. 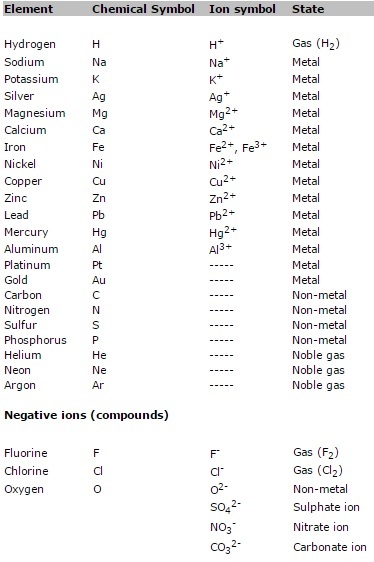 Group 1 contains the alkali metals. They react violently with water and giving away one electron, thus forming ions having a charge of plus one (+1). Group 2 contains the alkaline earth metals. They all want to form ions with the ionic charge plus two (+2). This is because they like to donate two electrons. Group 17 contains the halogens. These like to react with the alkali metals (group 1) and create salts. A halogen then adds one electron from an alkali metal. The halogen gets the charge minus one (-1) and the alkali metal gets the charge plus one (+1). Example: a sodium atom donates one electron to a chlorine atom. The sodium atom becomes an ion with the charge plus one (+1). The chlorine atom that receives one electron becomes also an ion, but with the charge minus one (-1). The scenario can be demonstrated when one-piece of sodium metal is placed in a container with chlorine gas. The chlorine gas is lethal if inhaled. Similarly, the sodium metal is dangerous to eat. When the substances react as recently described sodium and chloride ions are created. Together they form the salt sodium chloride that is used in cooking. Sodium chloride is “common salt”. Common salt is harmless when eaten in small quantities. Group 18 far to the right contains the noble gases. They do not want to react with other elements. The atom above depicts Argon - a noble gas located on the far right in the table of elements. The K-shell contains a maximum of two electrons. The L-shell contains a maximum of eight electrons. An ion is an element that has in the nucleus more or fewer electrons than protons. This makes an ion charged. There are thus negative ions and positive ions. Positive and negative ions tend to attract each other and form salts. Molecules are atoms in gang. Examples of molecules are carbon dioxide (CO2), nitrogen gas (N2) or ethanol (C2H5OH). In its entirety, a molecule is not charged. The atoms in molecules bind to each other because they share electrons. A hydrogen molecule (H2) shares two electrons. One electron comes from each hydrogen atom. All atoms have a certain desire to form noble-gas-structure in their outermost shell. The hydrogen atom wants to be similar to the helium atom. Therefore, the hydrogen atom wants to let its outermost shell (it has only one) have two electrons. This noble-gas-structure is reached when every hydrogen atom borrows one electron from one other hydrogen atom (see below). Look at the periodic system above. On the far right are the noble gases. Helium at the top has two electrons in its outermost shell. All noble gases below have eight electrons in their outermost shell. Hydrogen atoms want to have two electrons in their outermost shell, while most other atoms in the periodic system desire eight electrons in their outermost shell. A = Atomic number. The atomic number indicates the number of protons in the nucleus: 1H (hydrogen) and 2He (helium). The atomic number increases in the periods above such as: 1H, 2He, 3Li, 4Be, 5B, 6C, 7N, 8O, 9F, 10Ne, 11Na, etc..
Z = Mass number. The mass number shows the number of protons plus the number of neutrons in the nucleus. E.g. 1H (hydrogen) and 4He (helium). Look in a more detailed periodic table for the mass number. l = Charge. If the element is in ionic form the charge is shown here. Eg. Na+ and SO42-. n = Number of atoms connected. Eg. H2 (hydrogen molecule), F2 (fluorine molecule). A substance may be in solid, liquid or gaseous state. In what state the substance is depends on temperature and what substance it is. At “absolute zero” (0 Kelvin, 0 K) -273 °C, the atoms in the substance do not move at all. At this temperature all substances are in solid state. As temperature increases the atoms start vibrating although they are still in the same place and arranged in the same structure. If we take water as an example, the atoms in the ice have no movements at -273 oC. The temperature may be increased even more and the atoms in the water molecules start vibrating more and more. The water is still in solid state. The temperature is now 0 oC, and the ice begins to melt. The water turns to liquid state. In liquid state the molecules in water have abandoned their subject ice structure and the molecules are now moving freely in the water. All water molecules are constantly getting new neighbors. The water temperature rises to 100 oC. The water molecules are now exchanging neighbors even more often since they have more energy. The temperature is now 100 oC. More energy is supplied the water. The extra energy is absorbed by some water molecules, which use it to free themselves from the solution. These water molecules escape the liquid water. The water temperature will not exceed 100 °C in the water. Water molecules will absorb all extra energy added and escape the solution. The water molecules turn into a gas. When all water molecules have turned into gaseous state there is no water left in the container. All water has evaporated. What liquids conduct electricity and why? A solution conducts electricity if it contains ions. The tank above contains water with additions of sodium chloride (NaCl), carbon dioxide (CO2) and ethanol (C2H5OH). Charges of various kinds are attracted to each other. This makes the negative terminal of the battery attract sodium ions and the positive terminal attract chloride ions. Ethanol molecules and carbon dioxide molecules that are not charged will not move toward a charged terminal. 1. How is an atom constructed? 2. What constituents are there in an atom - which properties do they have? 3. What weighs the most in an atom? – protons or electrons? 4. What is distinct for each period in the periodic system? 5. What is distinct for each group in the periodic system? 6. What is the difference between ion and atom? 7. What is a molecule - explain? 8. What is the difference between an atom and a molecule? 10. What are noble gases - what are their properties? 11. What properties do the alkali metals have? 12. Why do some atoms join to form molecules? 13. What is the atomic number? 14. What is the mass number? 15. What is solid, liquid and gaseous state? 16. Tell what happens to water molecules when the temperature is -273 degrees Celsius and slowly rises to 100 degrees Celsius. 17. Which liquids conduct electricity and why? 18. Which ionic charge do usually the metal atoms have as ions? 19. Why do the halogens always have the charge minus one as ions? 20. Why do the alkali metals always have the charge plus one as ions? 21. Explain how two lethal substances can react with each other to form a harmless substance? 22. Does ethanol conduct electricity - why? 23. Does common salt (NaCl) conduct electricity - why?